Finally and at long last, Saturday was an absolutely gorgeous day here in Connecticut plus I had no more painting to do in Amanda's room so I decided to let the rest of the house sit and drove down to New London with my camera to see what I could find for a potential post for Lee's Sunday Scenery meme. My original intention was to go to the train station and take some pictures there but then I decided to see if I could find the lighthouse that I knew was on the New London side of the Thames River. I'd seen it many times from the Groton side of the river but had never gone looking for it but yesterday was the perfect day to go for a ride. Luckily, the lighthouse turned out to be quite easy to find (I just followed the road by the river!) and as there appeared to be nobody home I parked down the road a ways and then walked back to get a closer look. The lighthouse is on private property but I kind of trespassed a little on the rental property next door to the lighthouse (sshh, don't tell anyone!). 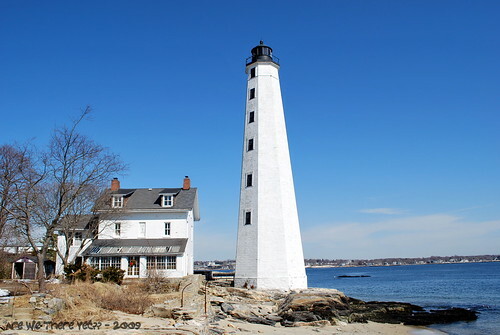 Replacing the original 64-foot stone tower with a wooden lantern that was erected at the west side of the harbor entrance in 1761, the New London Harbor Light was built in 1801. 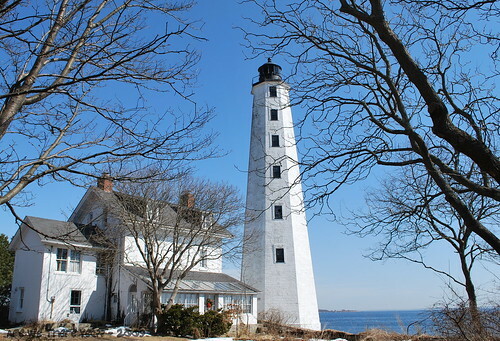 Standing at 89-feet tall, the octagonal stone lighthouse with a cast-iron lantern is the oldest and tallest existing lighthouse in Connecticut and was one of the earliest American lighthouses with a flashing light. The present keeper's house was built in 1863 and was enlarged in 1900. The keeper's house seemed pretty much abandoned and it looks like it's need of a little TLC - at the very least someone could remove the wreath from the front door! 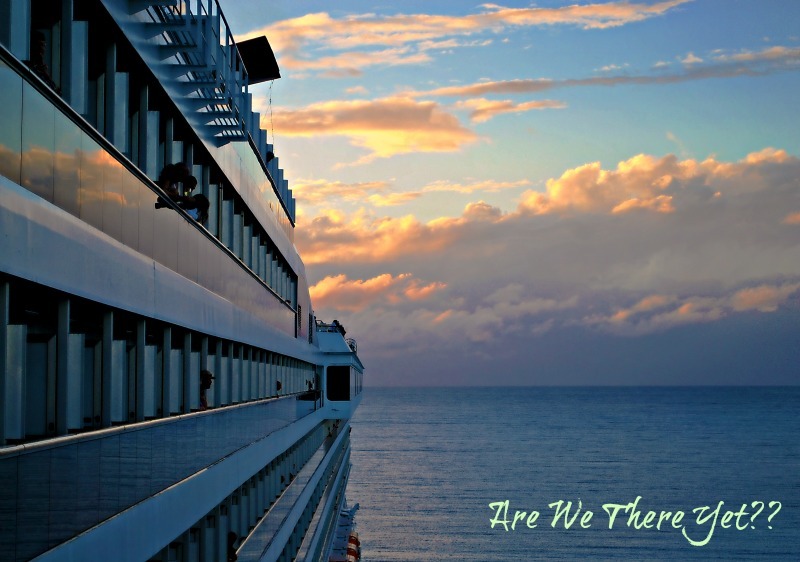 I'm not sure if someone currently resides there or not (maybe one of my readers knows?) but I do know that the lighthouse is not open to the public at all which is too bad - gimpy back and all I'd love to climb to the top and check out the view! Speaking of views, this picture is just a slightly different view, taken from the front of the driveway rather than from the side of the house next door (which looks to be a lovely rental if one had the cash for such a thing!). Once you're done oohing and aahing over the beautiful blue skies in these pictures, don't forget to pop by Lee's Tarheel Ramblings and check out the rest of the Sunday Scenery! What a glorious place. Your journey was really productive. 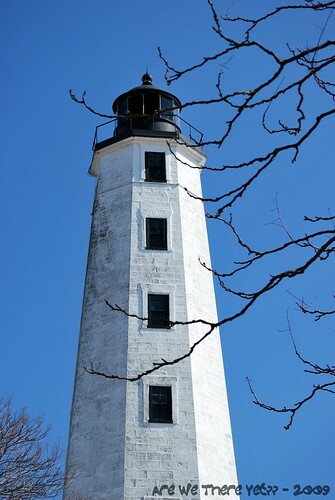 When I was a kid my family went and toured the Cape May Light House. It was pretty neat to climb all the way to the top and look out at the ocean and the rest of the town. Love lighthouses, love your photos. What a glorious day you had. Linda,thank you for the pic of the light house. Fabulous shots Linda! You're getting really good with that camera! How fun Linda. What a nice restful day that you so deserved. I love all the shots. I'm glad you had such great weather. Recharged your batteries didn't it. It would have mine. Its beautiful, I need to take a day trip. No glasses, no trip to Florida... I spent more than half of the weekend (starting early afternoon!) with no internet for 24 hours. Then yesterday I decided to sync my iphone to my home computer and wiped out my Contact list on the computer. Issues. I haz dem. What great shots and the wheather certainly was glorious. I love light house scenes so thanks ever so m uch for sharing these lovely pictures. OK, I'm done. Beautiful photos Duchess Linda. I liked learning a bit of history about the lighthouse as well. I took some photos yesterday on our way to Hartford. "Patti's photos from the passenger seat" may just become a post when I get to it. You know I love lighthouses. They are a symbol of hope and a beacon to guide us through the storms of life. I'm so glad you made this journey and shared it with us. That is awesome. (I'm gonna have to learn my adjectives!) The east coast lighthouses seem different to me. I love the first photo especially - the bare branches/twigs against the sky. I'm so glad you let yourself out of the house for a while! what is it about light houses that appeal to so many people? Great photos! My favorite photo is the last one. I like the view of the house and tower in one shot. Makes it look comfy and cozy. Beautiful, just beautiful!! Through pictures like this, I do miss New England so much. Very pretty pictures, Linda! This lighthouse is familiar; as this is where alot of your "charges" will sit and enjoy "103" in between discharges in that area. Many-a-time I've stared @ this particular beacon & wondered what it would be like to go inside. Ooohing and Ahhhing just like you said! I love lighthouses. In my first apartment my kitchen was ALL lighthouses, plates, glasses, decor on the walls, curtains, wreath, you name it, it was all lighthouses. Now I want to go back to NJ and scope out some of my favorites, Cape May, Barnegat & Sandy Hook. Interesting lighthouse set beneath a stunning blue sky! It certainly has a regal beauty! I imagine that there would be a narrow, winding stairway to the top inside!